Self Hosted Blog gives you high quality resources and tutorials for learning the WordPress web hosting platform. 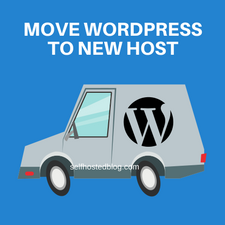 Are you looking to transfer your WordPress site to another host? 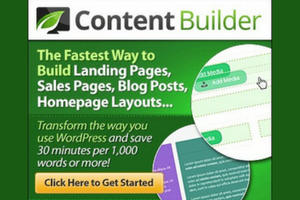 Or maybe you are using a free blogging platform and decided to go self-hosted? I have been slowly moving a few of my blogs to a new webhost and wanted to share the process I followed. I had websites hosted at GoDaddy and HostGator. 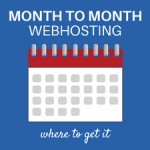 I had a few over at GoDaddy and was testing out HostGator with one website to see if their webhosting services were a good fit for me. I purchased a year of hosting and when it came due, I was out of there! My sites were just too slow. Although HostGator was somewhat better but still slow, it didn’t offer any outstanding features. My first step was to find the best hosting for WordPress sites. 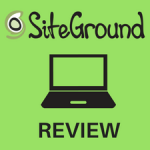 I did extensive research on the topic and decided on SiteGround hosting. You may have heard of them. They have excellent WordPress web hosting. I moved one blog over to their StartUp plan. I wanted to test it over three months to see if the site speed was amazing as well as their customer service. I found SiteGround’s instructions very easy to follow. Once inside the account, I had no problem following along to get things done. SiteGround uses a cPanel which is much easier to work with and understand. Contrast that with GoDaddy where it was hit or miss every time I logged into my account to get something done. Here’s my speed test. I have mentioned this in other posts but it’s worth bringing up again. Your site speed is one of the top Google search ranking factors. If you are suffering from a slow website, I get it! That was me. Even after optimizing my WordPress site, it was too slow. That’s what got me started with moving WordPress to a new host. When choosing a new WordPress host, there are a few things to consider. The mistake that many people make is going with the least expensive hosting but that’s not the most important factor. 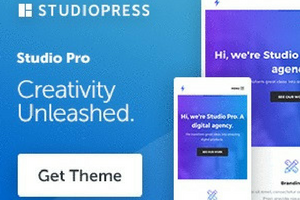 I highly recommend SiteGround. You owe it to yourself to check them out. Offering reliable shared hosting, SiteGound’s uptime is 99.99%. They’ve done a great job of minimizing downtime risks. I love this! If you are looking for hosting for WordPress sites, they are built for speed! SiteGround uses their own caching tool, the SuperCacher to drastically increase WordPress speed. My favorite feature! Customer support is fast through phone, chat or support ticket. Plus they have a complete knowledge base and tutorials on most things. If you have one website, I recommend the StartUp plan. The good news is that you can always upgrade at a later time. I actually did that. I started with the StartUp plan. After my final decision to move my other websites to SiteGround hosting, I upgraded to the GoGeek plan. Customer support was fast and communicated everything to me clearly. I was so thankful for that! Your first step is to purchase a web hosting plan. Once you complete that DO NOT install WordPress. 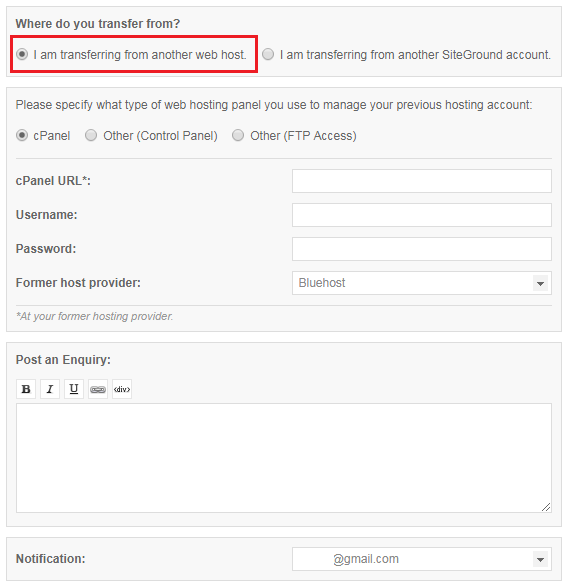 When you fill out the information to get started with your hosting plan, select Website Transfer. 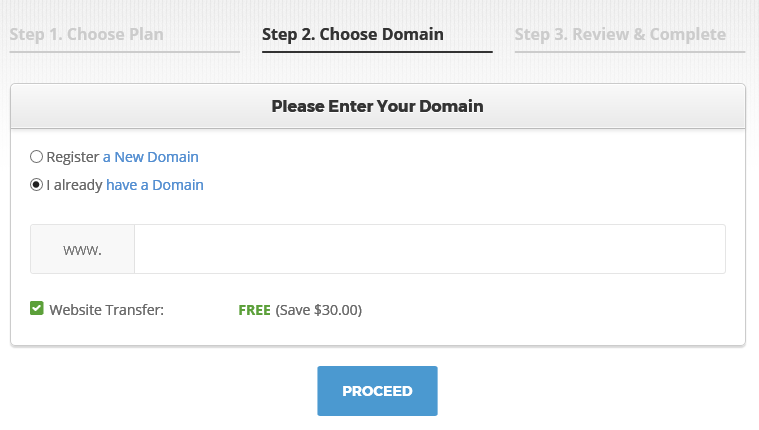 You’ll see that in Step 2 Choose Domain. This service is free. I just used the website transfer service today which is why I am so excited to tell you about it! I had already moved like 3 other websites over to SiteGround hosting and was too overwhelmed to do it again. I decided to use their service. I was a little nervous but now I am so impressed! First of all, they say it takes about 48 hours to complete. Mine was done in about 2 hours. Yay! To get the transfer process started, I filled out a support ticket. 2 – Next, you will see two drop-down options. The website transfer category is selected by default. From the Select Account drop-down, choose the website you want to be transferred. 3 – Next you’ll see this form. Here’s the information you’ll need to fill in. If you aren’t sure of the information, you can get it from your current web hosting provider. 4 – When you finish filling in the information, click Submit. After I completed this, I received an email and saw a support ticket in the Support area. The transfer was being processed. To my pleasant surprise it was finished in a short time. I received another support message with all the information I needed to test out the new site before I redirect the DNS for the domain. They included links to instructions to further help me. I followed the instructions and went through the entire website to make sure everything was good. I then pointed my domain DNS to the new SiteGround webhost. SiteGround will send you the new domain name servers too! This was the easiest all in one WordPress migration. When I did it myself, my lack of know-how ended up taking a lot longer. I had to redo the theme, widgets and lots of other stuff. This was a much smoother WordPress transfer and I would even pay them to do the next one! 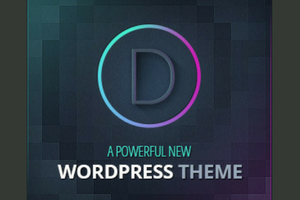 Are you feeling overwhelmed at the thought of transfering your WordPress site to a new host? I highly recommend SiteGround’s WebSite Transfer service. You get one free with your account. It’s so good I would happily pay for it next time! 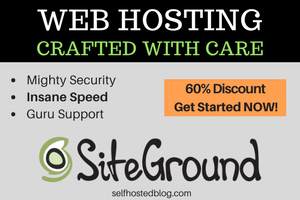 Get 60% off web hosting at SiteGround now. Most Posts Like this One! 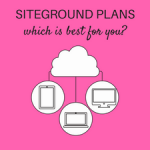 What is the Best SiteGround Hosting Plan? Self Hosted Blog: What is it and Why do you Need One?